This could be You! Political Risk Analyst in Washington, D.C.
Caroline Horres ’12 works in D.C. performing political and economic risk analysis by putting her bachelor’s degree in political science, her master’s in international economics, her Arabic fluency and her passion for current events to use every day. As an analyst for a discreet boutique strategic consulting firm, Horres helps the firm’s private clients decide where and when to direct their international investments. Q: What are your responsibilities as an Analyst? A: I’m part of a team of analysts at the firm. We do due diligence, strategic consulting and political risk analysis for our clients. We only work for private companies, which will come to us and say, for example, “We do operations in Thailand and it looks like the government is not entirely stable there, can you do a forecast on what’s going to happen and how that’s going to affect our operations there?” Or a client may say, “We’re interested in getting into extractivesin East Africa, what does that look like?” So it can be as specific as the first question or as broad as the second. RELATED: Learn more about the political science major at the College of Charleston! A: The only constant in my day-to-day job is keeping up with current events and being aware of what’s going on all over the world. I could have a client come in an ask a question about Thailand or about East Africa, so I’ve got to know enough about each place. I also had to learn to learn very quickly about different places and governments, because I had to be able to switch topics rapidly and have knowledge across the board. A lot of this job is knowing how to research to find out about events quickly. I know what databases to search for certain topics, which scholars or think tanks to use for others. Our interaction with clients can vary – sometimes it’s just me working with the Director of Research at my firm and other times all the analysts are working on a single client’s project. I generally have at least two active projects at a time, and then I’ll help with anything else that comes my way. A: I like that I get to learn a lot about everything. I stay on top of what’s going on in the world. My personal obsession is Iraq and Jordan, where I studied abroad, so sometimes I’ll get people who come to me with questions about projects on those places so I’ll write up a brief answering their questions. If I weren’t researching and writing about Iraq and Jordan for clients, I would be doing it in my free time, so pursuing topics I’m so passionate about at work is really great. Q: Is this position different than you expected it would be before you started? A: It’s a lot different – partly because of the culture here. I’m working at a very small firm, there are only about 25 of us, so the culture is very different than some of the bigger firms in D.C. where analysts have to bill a certain number of hours and they’re working 60-hour weeks. That’s not the case at my firm, it’s a casual culture. We work hard when we’re here but the firm facilitates a great work-life balance. Q: How did you hear about this job and what was the interview process like? So I sent in a resume and some writing samples and came in for an interview. The interview was around two hours long. Then about three weeks later I got a call and they offered me the job. It’s interesting because my employer is such a small firm, so they don’t do much publicizing. We value working closely with the clients we have and we rely on word of mouth to get clients, so it’s hard to find out much about the firm. I just trusted this professor who went on and on about how great it is. I think it’s a place you just have to fall into, but it’s a really great place to be. Q: What made you decide on the private sector instead of the government? A: When I was in graduate school the government shut down briefly and it stopped hiring. A lot of my classmates who were interning and hoping for a full-time position after school were told, ‘We really appreciate you being here but we are not going to be hiring until January 2015.’ So that was difficult for everyone in my year to hear. Since then a lot of that pressure has alleviated and several people I know have gotten jobs in the government, but I think that turned a lot of people off. I’m still interested in the possibility of working for the government in the future, but I’m very happy where I am right now. Q: How do you think the College helped you prepare for this position? A: When I was in graduate school I referred to notes from Dr. Creed’s classes on the Middle East and Dr. DesJeans’ classes on national security pretty frequently. I’ve continued to use the contextual knowledge that I learned in the classroom. I also built habits for certain classes, like one geography course required that students read the New York Times every day, and that got me in the habit of reading the newspaper, which is imperative to my current position. School also helped me prepare behaviorally for success – I learned to become a stronger writer, to care about what was going on in the world, the importance of establishing relationships with professors and being able to ask them for help. 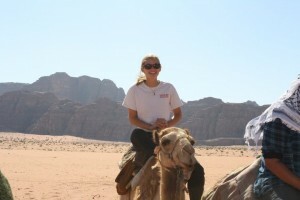 My study abroad experience in Jordan was absolutely crucial as well. Q: Could you have been hired for a position like this without a graduate education? A: I think graduate school is necessary. I know that the firm rarely hires unless you have a graduate degree. Some other firms will hire people without graduate degrees, but I know how much I grew in graduate school – my writing and Arabic skills improved a lot and I developed knowledge in international economics. If you spent your entire undergraduate career preparing for a job like this you could do it without graduate school, but you would have to know from the time you entered college that you want this career. You’d have to focus intensely on languages, international economics and current events, and I wouldn’t advise anyone to forgo the college experience by obsessing over preparing for this job. Graduate school is the wiser path. Q: What advice would you give to current students interested in political risk analysis? A: I would advise students to study abroad, learn a different language – specifically critical languages like Russian, Chinese and Arabic – Stay up to date with current events and take good economics courses. The College has a lot of excellent professors who have incredible knowledge and who can also help guide you and motivate you to accomplish things you didn’t know you were capable of. When I was applying to graduate school I thought that Johns Hopkins University, which is where I ended up, was out of my range. Dr. Desjeans said, “No, this place is made for people like you. This is where you belong.” I suggest that you find professors and a support network that will encourage you and also challenge you. majors and minors. See you there on Wednesday, August 27, 6PM (RAND 301B). money she raised through a Kickstarter campaign. 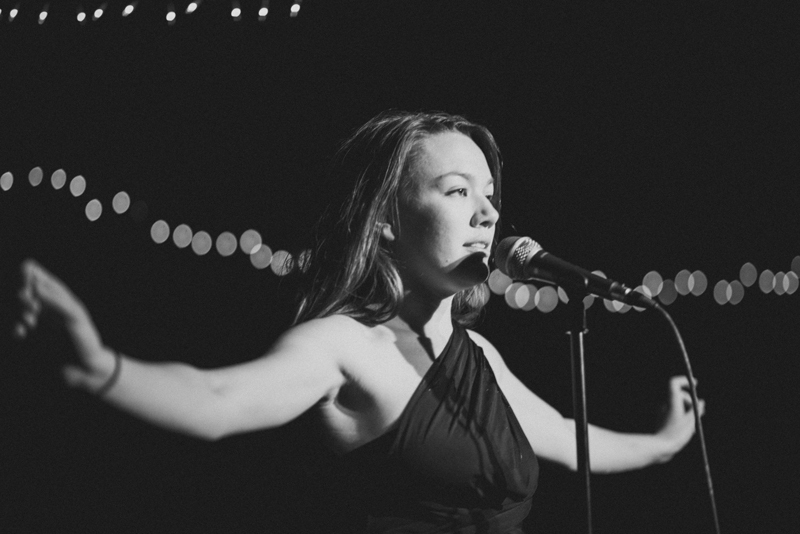 The play, which deals with dating and domestic violence against women, was well received in Charleston. Now, McClellan is taking the show she wrote and co-produced on the road, where she hopes it will raise even more public awareness about the prevalence of the problem. We are pleased to welcome and welcome back all of our Classic students this fall. It promises to be an exciting semester. Look here for announcements and events for the Classics Club and the department. Professor Nancy Nenno’s study “Language, the Voice and Esperantism in Early German Sound Film: The Case of Niemandsland” has been published in the journal Colloquia Germanica 44,3 (2011). The School of Languages, Cultures and World Affairs (LCWA) at the College of Charleston invites applications for a full-time tenure-track Assistant Professor position in Arabic language and Arabic Studies to begin Fall 2015. The successful candidate will have primary teaching responsibilities in Modern Standard Arabic language at all levels, with a 3/3 teaching load. Candidates should have native or near native fluency in Arabic. A Ph.D. in Arabic language and/or literature or related field by August 16, 2015 is required. As a minimum requirement, candidates should possess an advanced degree or certification in Arabic of at least 18 graduate hours. A.B.D. candidates without completion by August 16, 2015, will be considered at the instructor rank. The candidate will participate in a growing program in Arabic and Arabic Literature and Arab Studies as part of an Asian Studies program that also includes faculty in Chinese, Japanese, and Hindi, as well as Art History, History, Philosophy, Political Science, and Religious Studies. The College of Charleston is an urban campus situated in the Historic District of Charleston. Building on its historic strength in languages (a two-year sequence is required of all students and over 60 full-time faculty teach thirteen foreign languages), the School of Languages, Cultures and World Affairs at the College of Charleston provides students with exceptional curricular programs in foreign languages and area studies. Students in Arabic have recently been awarded the Boren Fellowship and the Critical Languages Scholarship. Applicants apply online at JOBS.COFC.EDU. Submit: cover letter with statement of teaching philosophy and research program, curriculum vitae, unofficial graduate transcripts (official transcripts will be required for hiring), at least one representative publication, evidence of teaching effectiveness, and contact information for 3 reference providers who will submit reference letters online. For additional information contact Mary Beth Heston, Chair, Search Committee, at hestonm@cofc.edu. Screening begins September 15, 2014 and will continue until the position is filled. The appointment will begin August 16, 2015.